Wow! I’m excited about this since my camper doesn’t “fit” in the overall conception of most when they think of camping “trailers”. 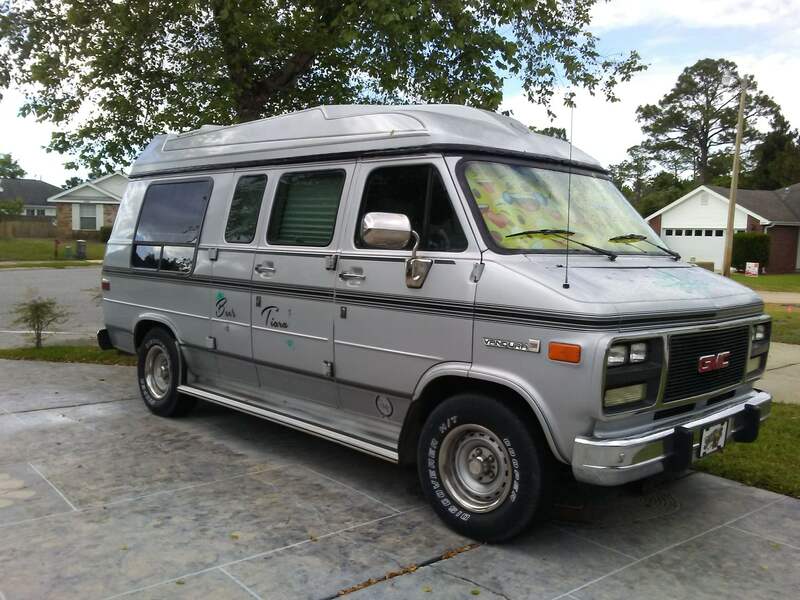 Anyway, my story probably begins 40 years ago when my husband and I began camping with our 1 yr old daughter in a 1978 cargo van that we converted to a camper. 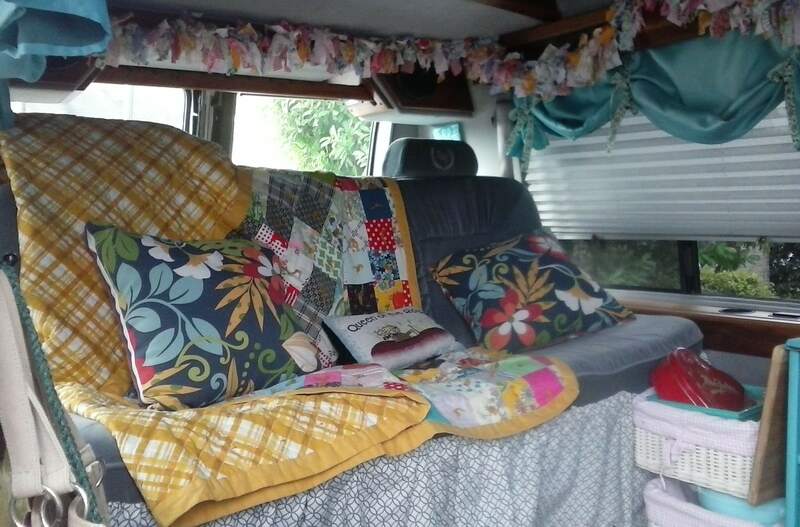 It was only natural that when I joined SOTF and began camping alone that I gravitated to looking for a van. It took me 6 months to find the “right” one, one that I could afford and didn’t need too much work! Well, I found it at the local Flea Market and when I called the owner, discovered that he and his family went to our church! I knew then that it was THE ONE! 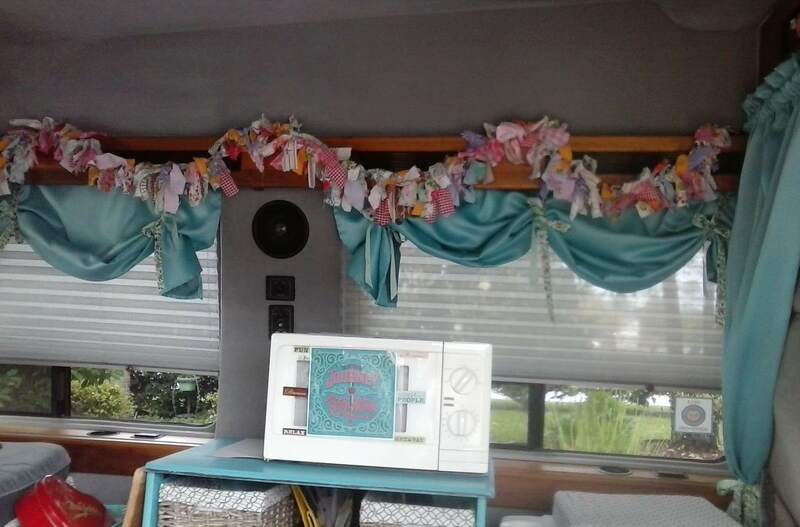 It is a 1994 GMC Conversion Van but had never been used for camping. I am the 3rd owner and the previous owner used it to take their grandchildren to the beach. My nickname is “Bee” and the company that did the interior at the factory was “Tiara Motor Company “, so the logical name is “Bee’s Tiara”. We proceeded to take out the 2 middle seats(my husband has put a lot of time and sweat into her too!) and to decorate. I purchased a used TV stand, painted it and we bolted it to the wall and this is my “everything”- my microwave sits on it, storage in the drawer and added baskets and we attached a cutting board that I also use as a “night table”. My colors are gray and turquoise which I love. I purchased custom decals from a SOTF that I put on the outside, which consists of flowers and bees and of course its name. The back bench seat goes down for a bed. My “theme” is just comfort. I can stand up in it and it is perfect for one person. The only negative is reliability and having too much $$ invested in it. I have been stranded on the road 3 different times because of my transmission, my fuel pump and my alternator. But that is why I have AAA!! It has cost me more than I intended but I love camping in it and love the fact that I can park anywhere and just unplug to go. And I don’t have to store it, just park it in my drive. I feel safe and comfortable no matter where I camp or park. I have had it 4 years and still love when I pull out of my driveway and head to wherever.